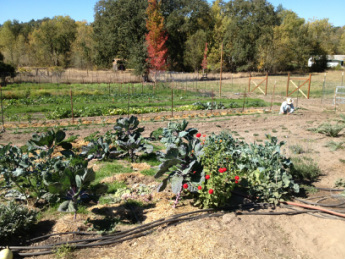 Our largest plot is in Forestville, CA. It is a beautiful piece of property with full sun exposure and we've gone crazy planing everything under the sun. We started this garden in June of 2013. Since then, Eric has installed an irrigation system, a vegetable washing station, a 30' greenhouse, barn greenhouse, a tractor shed, a solar hot water system to warm the greenhouse, a chicken tractor and a hardening off shade structure. We farm year-round for our restaurant clients. Vicky's Garden is our biggest urban farming plot. We are growing in Vicky's front and back yard. Eric built a beautiful greenhouse in the backyard for our seed starts and to extend the growing season. This has also been the biggest transformation -- from weedy and rock-filled (6 yards of rock...but who's counting) into lush, productive garden beds. We are growing a wide variety of veggie, greens and flowers in Vicky's Garden. We started planting our yard in January 2011. Yes, January -- one of the major joys of Northern California Living! We quickly ran out of space in our tiny yard and turned to our neighbors for help. Judy K. (fabulous neighborhood organizer) sent out an email to her neighborhood list and we instantly started getting phone calls with invitations to come investigate potential garden sites. We are still looking for more plots. If you live in or near the Burbank Gardens neighborhood give us a shout. In our tiny front yard (400 sf) we are growing what I think will be 1,000 tomatoes, corn, winter squash, crookneck squash, zucchini, onions, scallions, chard, basil, potatoes, beans, peas, flowers, herbs, beets, carrots, eggplant, pepper, artichokes, blueberries and raspberries. Plus we have dwarf lemon, apple, persimmon, apricot and nectarine trees started.